The happy person driving down the road while his buddy rides along, head hanging out the window, ears flapping in the wind, is an iconic image for dog lovers. That’s why it was so exciting when Beau, my aunt’s new dog, jumped into the car with no help — and with great enthusiasm — recently. 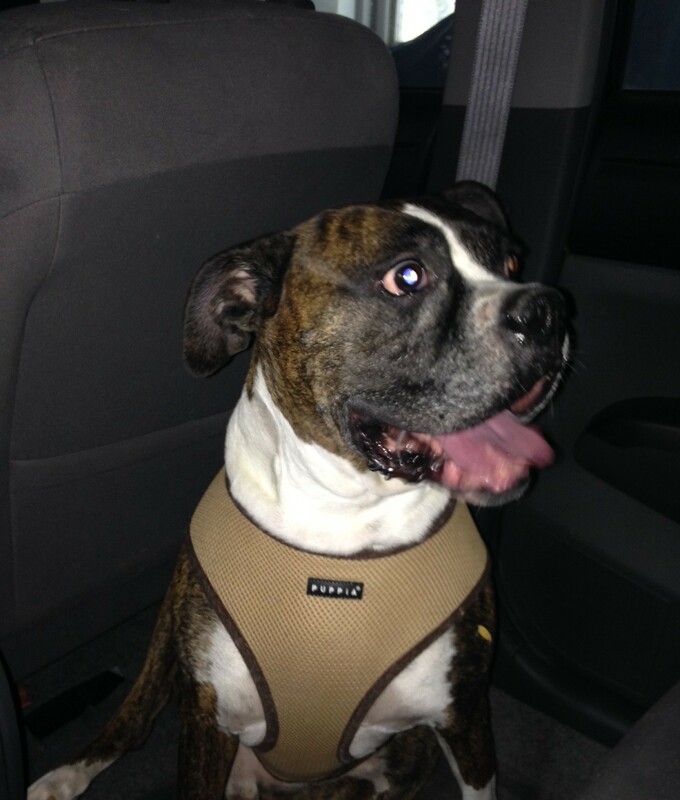 He had surgery on both knees before my aunt adopted him from a boxer rescue group, and his hind legs are still shaky. We were even more thrilled when he jumped onto the back seat from the foot space. He wanted to sit next to me, which was gratifying. But I’m no longer visiting, and he’s still getting up onto the seat. He seems enthusiastic about going for rides and is equally thrilled with the adventures in store when the car arrives at its destination. He’s been on walks in different places and helped drop off the recycling once. Now that Beau is willing to get onto the seat, we’re wondering what kind of rider Beau will be. Is he the head-hanging-out-the-window type? Not all dogs are. Cali’s riding style is to sit up and look out the window, watching everything that goes by. When she realizes we’re going someplace familiar and fun — her sister’s house, for example, or the dog beach — she gets really excited and starts pacing and sometimes squealing. For this reason as well as for general safety, I usually seatbelt her (and the other dogs) when we’re off on a car adventure. Cali gets the window seat on the passenger side of the car; if she were sitting behind me, I’d have to contend with more than her vocalizations: She likes to lean over the shoulder of whoever is sitting in front and nuzzle that person’s neck — and drool on her shoulder. Alberta gets the middle because she likes to poke her head between the front seats and say hi to the driver and passenger. For a petite Lab, Alberta has a surprisingly heavy head. It can be hard to get into the storage console when she’s in the car, using it as a pillow. And forget about using that console as an arm rest. Jana is the most mellow rider in the family. She curls up and snoozes. Sometimes she cuddles with Alberta. 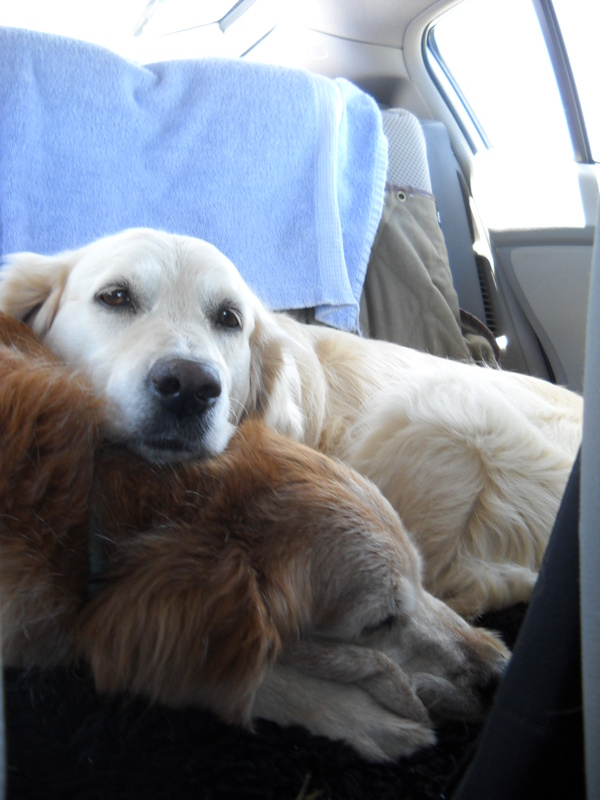 Several years ago, when Oriel was still with us, Jana and Ory spent most of a cross-country drive snuggled up together in the back seat. On a recent trip to Yellowstone, we did get Jana to sit up and take notice, but only when the bison came right up to the car. Fortunately, all of our dogs love car rides. But some poor dogs are scared or get carsick. For them, a car ride is worse than a nail trim! Whether Beau hangs his head out the window, drools on his driver, or just sits there and smiles, I wish him many miles of enjoyment in the car. Molly is always reluctant to get into the car. She pretends to be an old lady, and drags herself up into the car like she needs to be lifted, even though she can leap like a rabbit when she wants to. Once we get to our destination, though, she gets really excited, especially if we’re at Grandma’s house! I have a question. When Molly was a puppy, she had really bad separation anxiety, and would tear stuff up when we left her home alone. After a while, she seemed to figure out that we always came back, and she grew out of it. Now, all of the sudden, she’s started tearing things when we leave again. Do you have any ideas as to why that problem would reappear, and what we should do about it? How old is Molly? Some older dogs show anxiety (even if they never did when they were younger). I think it is because they don’t see or hear (or both) as well and just are less comfortable, even in a familiar environment. When you are home, she probably feels a lot safer. Jana, my older golden, is a LOT more anxious than she ever was as a young dog, and it does not seem to be tied to anything specific. Molly is 7 now. As far as we know, she seems to see and hear pretty well, but we’ve never had her hearing/sight tested or anything. She’s probably reluctant about cars because when she was a puppy, she had motion sickness the first few times she rode in the car, and never got that negative association out of her head. She likes going places, she just doesn’t like the ride. She usually goes to sleep if the drive’s a long one though.